Push Start glorifies the past. 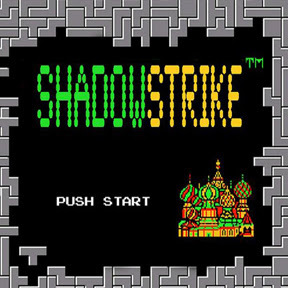 The first thing that will grab you with Shadowstrike's music is the theme. While the band won't win any awards for being particularly unique, the central motif that revolves around each song is a novelty that many acts don't think to toy with: classic Nintendo games. The act's first EP, Push Start, is a blend of time-tested aesthetics and over-the-top theatrics that power metal is known for, but with gaming at the forefront of the banter. Without the tasteful cheesiness, however--and the cheese is hot, melted, and dripping--they wouldn't have quite the same charm, either. Shadowstrike tag themselves as "Long Island's Most Epic Band" and, despite being a bold claim, it's fitting for their music. Video games and metal simply wouldn't work without any epicness, the kind that envisions a knight coaxing a dragon from its lair for a battle, or a plumber fending off a spiked turtle that plans to kidnap the princess. Even the cover's 8-bit inspired imagery hints at what's hiding underneath, which is something not often said of album art. Shadowstrike favor the more melodic side of power metal, but a myriad of excellent guitar riffs--in the form of gallops and alternate picking--place the music somewhere between calm and aggressive. Fans of Cellador will undoubtedly feel at home with Push Start, but listeners into power metal, regardless of preference, will find the band enticing enough to listen to more than once. Therein lies the band's appeal; the ability to have anyone relate to their music, thanks to the popular form of entertainment that is video games. The most enjoyable aspect is the uplifting chorus that compositions are often built around: Shadowstrike no doubt have the blueprint down to a T, but this might be why they don't stand out as much as they should. The already overflowing sea of power metal groups do essentially the same thing, rendering them stale and prosaic. And although Shadowstrike avoid being completely generic, they don't do much to differentiate themselves from the pack, which is perhaps their biggest downfall. But in spite of that, Shadowstrike have taken a seemingly "un-metal" concept and fused it with our favorite music, be it with lyrics or aesthetic overtones. It's surprisingly top-notch, but as a now-converted fan, I'd like to see more video game moments pop-up. The epic cheese can certainly bring it on any time it wants. It is power metal, after all. Great band, amazing group of guys. I wish this band the best of luck in every future endeavor, and I hope they don't change their "hot melty cheesiness" ! !